We love exploring our cool, charming small towns nestled in the Blue Ridge Mountains of western North Carolina. Find picturesque historic Main Streets, friendly shops, general stores, farm-to-table restaurants, breweries, art galleries and quirky finds. Each town has its own personality and many things to do surrounding the Asheville area. Meet some locals and experience a leisurely day of exploration, just like Mayberry. Your first stop should be the town's Visitor Center to get insider tips to find places that match your interests. Since many of these towns are in close proximity, it's easy to visit several in a day (see map at bottom of page). Photo above is Sylva. 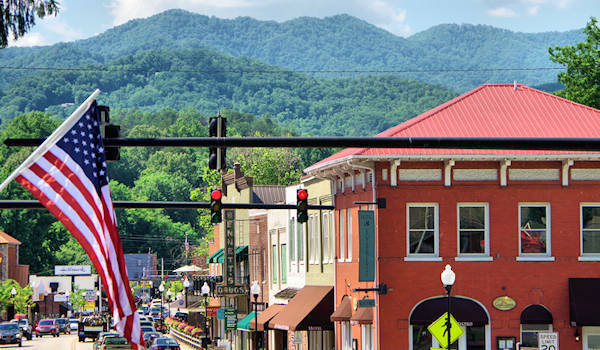 This artsy village is just a few miles from Sylva. On the banks of the Tuckasegee River. Dillsboro has been a tourist stop since the late 1800s. 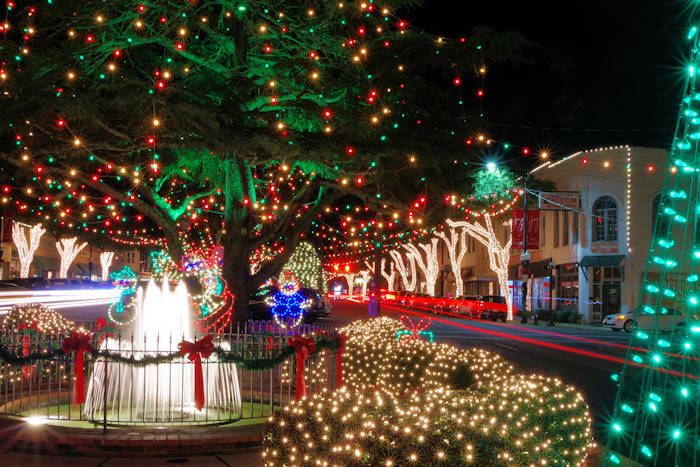 Although it's a tiny village, find an impressive mix of specialty shops and galleries representing many local artists. Go to many art festivals. Many arrive by train on the Great Smoky Mountains Railroad on an excursion. This tiny summer retreat along the Blue Ridge Parkway is known for its charming architecture, historic inns, gem mining, winding motorcycle drives and amazing book store. Near Spruce Pine. Stroll this picturesque historic "town" in the city of Asheville near the entrance to Biltmore Estate. Find tree lined streets with trendy, mostly local boutiques, galleries, breweries and restaurants in buildings and cottages built by the Vanderbilts. While it's part of the city, West Asheville has its own vibe and busy Haywood Road lined with restored buildings filled a big variety of restaurants, bars, breweries, and funky shops. This quaint town is just a mile from the busy I-40. We especially love exploring the shops along Cherry Street. And don't forget the Swannanoa Valley Museum. Find an impressive selection of restaurants for a tiny town. Nearby Montreat is worth a quick sidetrip. This tiny town in the scenic Blue Ridge Mountains has a famous school, church fresco, historic buildings with gallery and weaving museum, plus much more. Near Spruce Pine and Banner Elk. Their small downtown area is filled with restaurants, galleries and interesting local shops. And it's only 10 minutes from both downtown Asheville and the Blue Ridge Parkway. Twice a year, they host the big Weaverville Art Safari with dozens of artists opening their studios to visitors. Nearby is Vance Birthplace State Historic Site. Many of our small towns have free printed guides that they will mail to you (free postage too!). Find 12 that you can order here - maps too!